Susan Petty paints because she has to. Her works chronicle timelessness and continuity. Her technical expertise resonates in both tightly detailed images of delicate lace and barren tracks of land. Yet she continues to learn. As a working artist she makes dozens of decisions simultaneously, trusting instincts that have been honed by years of experience. Petty realizes the subtleties of watercolor where she sees wonderful things happen with transparency and brilliance. Here the light source is beneath, from the paper. In her oil paintings, the light emanates from the surface brush strokes. Though the transition from one medium to the other is challenging, Petty is moving toward using oils to go big and abstract. 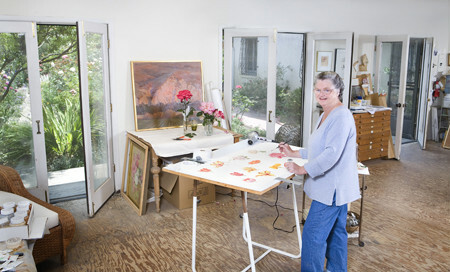 Her garden in Saticoy, California and road trips through the United States are great inspirations. There is never anything equivocal about what she paints. Maudlin and cute are not in her lexicon. It has been said that they are the kinds of paintings that should be the first thing you wake up to in the morning because they will make your day. Work by Petty has been exhibited widely in museums and fine art galleries throughout Southern California, including the Museum of Ventura County, and can be found in the City of Ventura Municipal Art Collection. Susan Petty’s documentation took place in 2005 and was sponsored by Lainie and Peter Cannon. The FOTM Archive contains extensive information about this artist.